Soundfront Cottage, 5 BR, 5 1/2 B. K * K * K * K * 2B * 2QSS. Sand Castle Club linen service with beds made. 17' x 25' swimming pool, hot tub and tiki hut gazebo. Soundfront Cottage, 5 BR, 5 1/2 B. K * K * K * K * 2B * 2QSS. Sand Castle Club linen service with beds made. 17' x 25' swimming pool, hot tub and tiki hut gazebo. 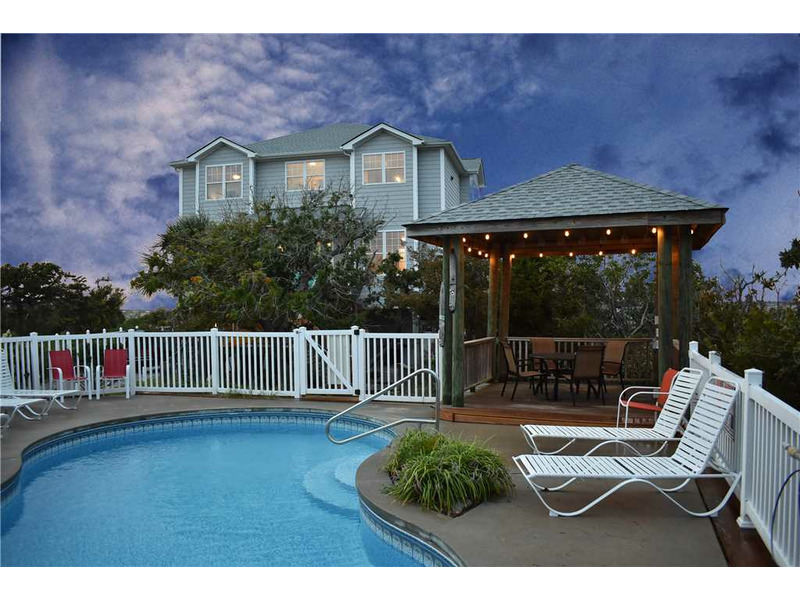 Heated pool is available for an additional $300 per week (operable only when air temperature is above 60Â°). Two spacious sound-side masters with K, private bath, jacuzzi, shower, walk-in closet, TV and water view balcony. Two additional suites with K, private bath, walk-in closet, TV and pool views. One children's room with two sets of bunk beds, private bath, TV/DVD/PS2 and pool view. Elevator to all levels (available for an additional $100 per week). Reverse floor plan with light filled great room offering spectacular sound views, bamboo flooring, 55" 4K flat screen TV and Blu-ray player. 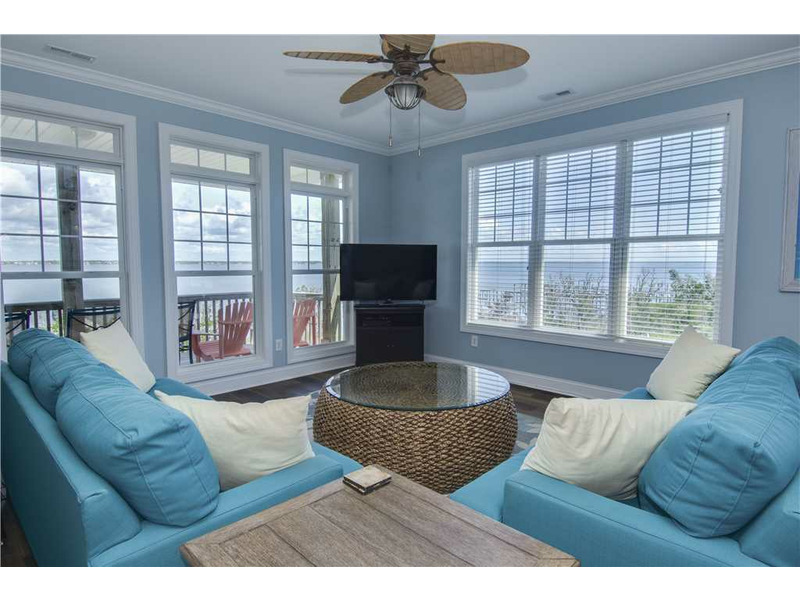 Sound view game room off great room with QSS, pool table, shuffleboard table, 50" HD flat screen TV, Xbox and screened porch. Study with wireless high speed Internet access. Elegant kitchen with stainless steel double oven, 2 cooktops and 2 dishwashers. Washer/dryer, 7 flat screen TVs, DVD players, ceiling fans throughout. Architecturally designed and professionally decorated. 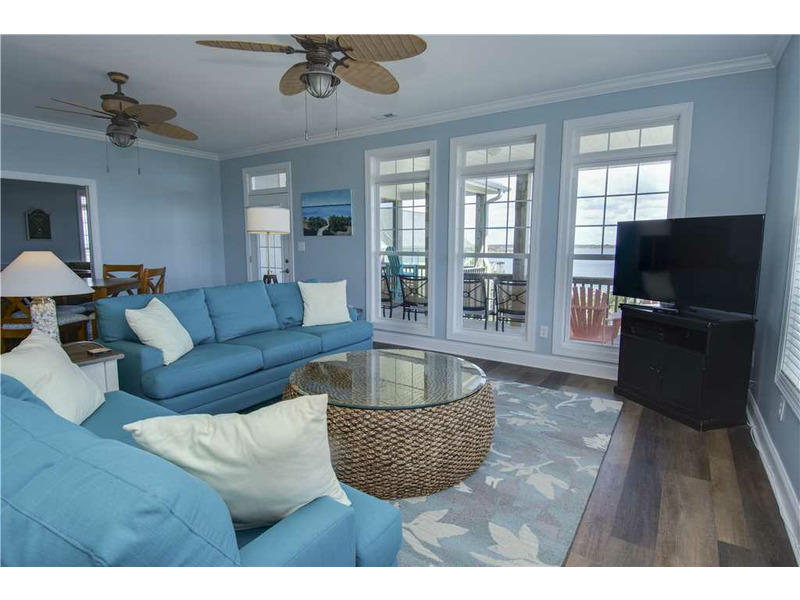 Large, furnished covered and open decks with spectacular views overlooking Bogue Sound. Gas grill, enclosed hot/cold outside shower with dressing room. Covered parking, sand play area, outdoor corn hole. 300 ft. pier with boat tie-up (shallow water boats only). Beach wagons provided. Tropically landscaped. Weekly only. No smoking. No pets. 4302 Emerald Drive. Visit online at www.emeraldislecottage.com. To send a reservation request to the manager of "Bay Breeze", complete the following form. When you click the "Send Request" button an e-mail will be sent to the manager and a copy will be emailed to you, along with details on how to complete your reservation. I saw Bay Breeze advertised on www.RentABeach.com and I am interested in renting. Clicking 'Send Request' will immediately forward this information to the manager of Bay Breeze, which is Emerald Isle Realty. An email copy of your request will be sent from support@rentabeach.com to the address you provided above.